One of the most significant keys to online success is getting website traffic. The more visitors you have, the better your chances for sales and profits. Presumably you have a niche and you know your keywords, and regularly conduct keyword research to stay on top of what’s popular. 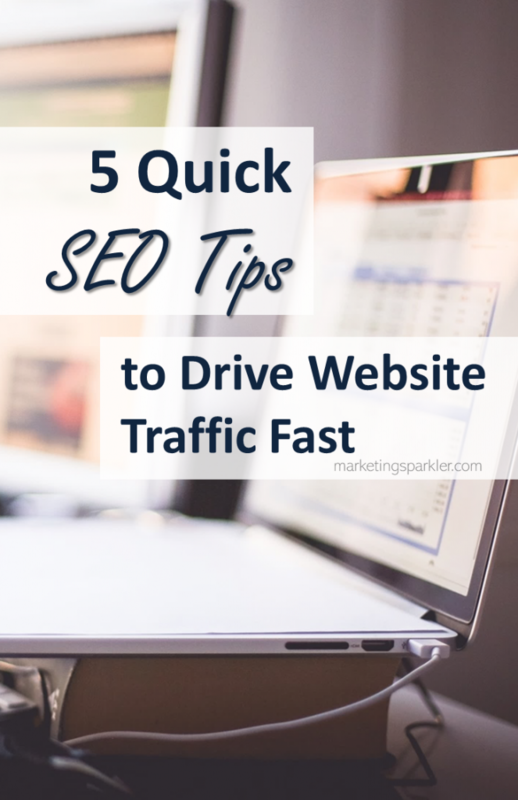 Based on those assumptions here are five quick and easy SEO tips to get website traffic fast! Tip #1 Make sure you’re actually tagging your keywords. Do you spend a lot of time optimizing your content and then neglect to tag them on your web page? So what’s a tag? Tags are where search engines look, and if there are no tags they’ll pass right by your web pages. Here’s a quick brief on tags. C. Meta Tags. Meta tags provide the small descriptive text found underneath the title tag on the search engine results page. Like title tags, these should be kept brief, informative and up to date. D. Alt Tags. Alt tags are used to provide a text description of a graphic. Every graphic on your site should have a description and an alt tag. Why? Search engines do not ‘read’ images, so the alt tag tells the search engine there’s an image on the page. Be sure to name your image with a descriptive keyword-rich title to complement your website/blog. Basically, you want to optimize your website and blog in order to be found by search engines for your desired keywords. If you are looking for more info on how to optimize a website for SEO, this infographic, The Anatomy of an Optimized Web Page, is a great stating point! SEO Tip: Every graphic on your site should have a description and an alt tag. Tip #2 Add content to your site weekly, or more often if you can swing it. Content is essential for traffic and a top search engine ranking. Content is what search engine spiders look for and index – without it there’s nothing to index or rank. Give visitors and search engines a reason to visit and index your site. Make a commitment to offer optimized content multiple times a week and your traffic will soar. Tip #3 Procure valuable and relevant incoming links. The more websites which link to your web pages, the more valuable search engines perceive you to be, though not all links are created equal. Search engines give more leverage to links from sites which are popular and credible, and from sites which are relevant to your website topic. There are different types of links: direct, text, and deep. A text link occurs when the webpage address is embedded in the text. Readers simply click on the link and are redirected to a new website page. How can you increase the inbound links to your site? Publishing media releases (formerly called press releases). Blogging and participating in social networking forums, chat rooms and social networking sites. Tool Alert: LinkOkay is a must have tool for anyone serious about SEO or internet marketing. Monitor your backlinks, grow traffic, rankings and avoid penalties – start at linkokay.com. Of all of the SEO tips I can offer, this is an easy one to do, no tech required. Now more than ever before, internet marketing is about building a community. Whether you offer a forum on your website or you participate in social networking sites, social networking is a valuable traffic generating tactic. Sites like Facebook and Twitter can be powerful tools for generating links and traffic to your site. Create a profile and then post comments, ask questions, provide insights and offer ideas to generate conversations. Get involved. Many chat rooms and forums are industry specific, find those which cater to your industry, and begin participating. Speak to and connect with a highly targeted audience. Be social, and be helpful, without directly sales pitching yourself to strangers. Get to know people first! Are you wondering how to find forums in your industry? Here’s an easy way: visit Google.com and type <your industry here> forum. For example, I’m a Social Media Manager, so I would search social media forum to find people talking about social media. Easy, I know! Tip #5 Advertise for more exposure and traffic. Advertising, when handled strategically, can be used to promote your content and products or services. Pay-Per-Click (PPC) advertising is often the tool of choice because you control the advertising budget on a daily basis and have the tools to test and track your advertising efforts. Once you’ve honed your PPC ads the return on investment can be phenomenal in terms of traffic and purchases. For maximum results, use all of the above SEO tips to create a traffic and SEO strategy. Outline your plan and your goals and then take the necessary action. Take advantage of these five traffic and search engine tips to get more eyeballs on your business. SEO is so important, especially nowadays. It’s something you really want to utilize and become familiar with if you are trying to gain traffic. Excellent article! SEO gets tricky because there are so many details to pay attention to. I hope this helps. Thanks for stopping by!